Serenity. That's all I can think of when I see this photo, everything seems still. 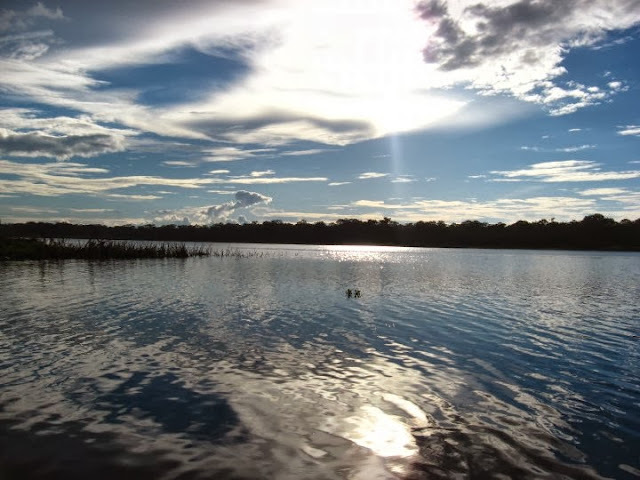 We reached this lake in the Peruvian Amazon by canoe. The jungle had been dense either side of the river, giving a sense of being boxed in by walls made of plants. Casting shadows on the dark water, the morning sun stretched to touch the far side of the watercourse. As we steered into the lake the world seemed to open up, leaving me with the conflicted feelings of being liberated from the confines of the jungle while also being very aware of how exposed I was. We had made the trip to the lake in the hope of seeing some wildlife. Sadly, no one was home. While there was a far-off sloth, he didn't seem very enthusiastic about seeing us. We paddled further around the edge of the lake, following its banks. A loud holler erupted from our guide, shattering the silence and stillness of the lake. He was calling out to the monkeys that were often around the lake. They answered him, a distant call ringing back through the trees. He offered to lure them down to the bank for us, coaxing them with offers of bread or some other treats. We barely considered this before declining it: we were in the Amazon, not a petting zoo. Bribing wild animals would sap all of the magic out of a place so unknown and so mystical. Better to leave the place with some of its power.